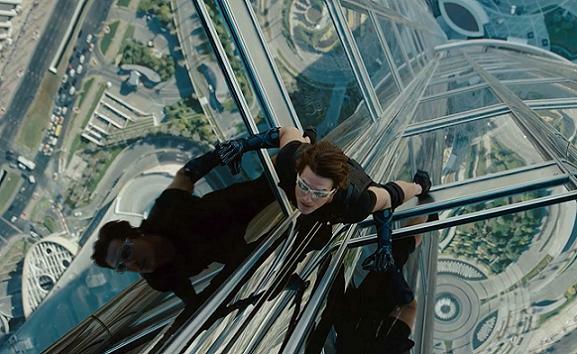 The Mission: Impossible films come closest to realizing the ideal of a film franchise. They are barely sequels, with minimal narrative threads connecting them, and cannot even be considered remakes or reboots. They are the same basic formula, international intrigue and high tech gadgetry, offered to a series of different directors, DePalma, Woo, Abrams, and now Bird, who become regional managers, adding their own panache and style to the central brand. The most recent film models itself after a James Bond thriller, complete with neo-Cold War tensions, and a mad man seeking to destroy the world in a nuclear baptism (how many times have we seen this before?). In order to stop this plot the men (and woman) pursue this villan across the world, from Moscow to Dubai and India. The film lacks the battle of wits and witty banter that took place between Bond and the nemesis of the moment, not to mention the romantic subplot. This is perhaps due to Tom Cruise, the franchise's only constant feature, and persistent handicap; he lacks the personality of even the worst Bond and overcompensates by running and straining earnestly. He is less a human being than a gadget, competent but devoid of character, like something designed by Apple. The film just follows him from high strung set piece to high strung set piece. It is as if it wants to keep him or us exhausted. What is striking about the latest film, however, is how much the threat of nuclear armageddon functions as a kind of "screen memory," concealing a deeper fear. In the Bond films the exotic locales, Japan, Haiti, Monaco, were either the playgrounds of Europe, or places off of the beaten path, the perfect locale for a hidden fortress. In Ghost Protocol, the fourth Mission: Impossible film, however, a similar path of exotic locales is traced, but what is striking is how they begin to suggest another globe, one outside of American (or European) influence. Dubai is presented as the home to the tallest skyscraper, a financial and business center in its own right, and India is shown to have its own TV production, its own media moguls. Combine this with a second narrative element from the film, the Ghost Protocol of the film's title, which separates the secret agents from American support and technology, and we get the film's true nightmare. It is nightmare of American decline, of a world centered on other nations. It is film of an empire in decline, "a cinema of hegemony unraveling." What is perhaps curious about this last point is that I saw this film after reading Simon Pegg's essay on Star Wars in Nerd do Well (a remnant of his academic work). He reads the film against the post-Vietnam malaise of American culture, arguing that its "galaxy far, far away" is the minimal distance for the US to imagine itself anew as a rag tag group of rebels fighting an evil Empire, complete with British accents. I could only wonder what Pegg, arguably the best human part of the film, thought of his recent Imperial fantasy. While M:I4 is situated by its cold war pretense and globalized fears, between past and future, Hugo is a film entirely framed by such temporal displacements, between the origins of cinema and its 3-D, digital instantiation, between Scorcese's own life as a fan of cinema and that of its protagonist Hugo, between the children's book and the grown filmmaker. There is much to say about all of these, and the first is actually quite effective. However, there is another temporal displacement that is not discussed as often and that is between the film's technological setting and its technological imaginary. The film is set in the early thirties, against the backdrop of film, but its technological fantasies are decidedly older. 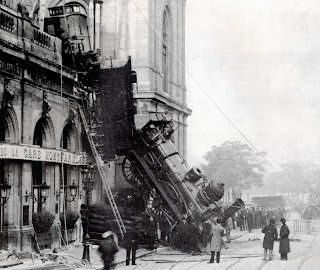 It is set in a train station, Montparnasse, and even stages by way of a dream the famous crash that took place there at the end of the nineteenth century. If one examines the film by the way of Manuel Delanda's history of the various abstract machines, clockwork, motors, and computing, a point that he develops in War in the Age of Intelligent Machines. This point has been boiled down to a simple thumbnail by writers such as Hardt and Negri, and it really is the caricature I am dealing with here. 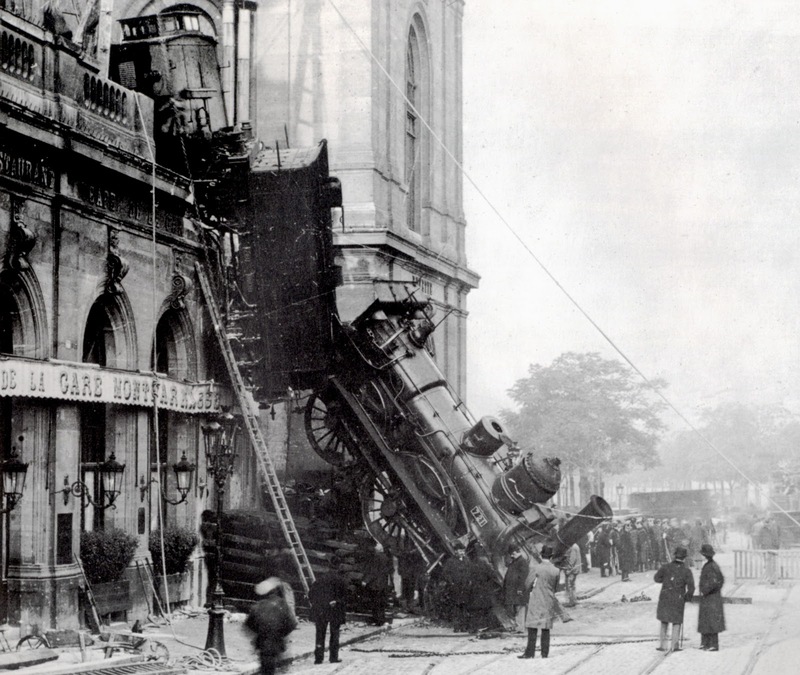 The central point of which is that different ages are characterized by not only a different technical machine, clockwork, steam, but a different way of thinking, the mechanism of clockworks, the conflict that drives the steam engine of history, etc. In this sense Hugo is firmly situated in the age of the mechanical machine. This is seen not just in its wind-up toys, clock tower, and automaton that is its MacGuffin, but in its explicit philosophy voiced by the child protagonist, Hugo. As Hugo states, "I'd imagine the whole world was one big machine. Machines never come with any extra parts, you know. They always come with the exact amount they need. So I figured, if the entire world was one big machine, I couldn't be an extra part. I had to be here for some reason. "This is the central idea of the film, it explains Hugo's quest, and George Méliès' despair, they are all parts without a place, parts whose happiness depends upon finding a place in the machine. I could not help but think about how this idea, this clockwork fantasy that is as much Platonist as it is mechanical, of everyone in their place, was received by the film's contemporary audience, many of whom may have lost their place in the great machine, or at least fear doing so. More to the point, however, this idea of everyone in their place, of society as one big machine, seems to contradict the film's central visual idea, the power of movies to provoke imagine, to displace people from their roles in society. More could be said about this, as I have already hinted, it is core of Rancière's entire reading of Plato, and perhaps his entire philosophy, but I am going to conclude by simply indicating that this conflict between the power of the imagination and the celebration of the existing order defines more than anything else the role of film today.